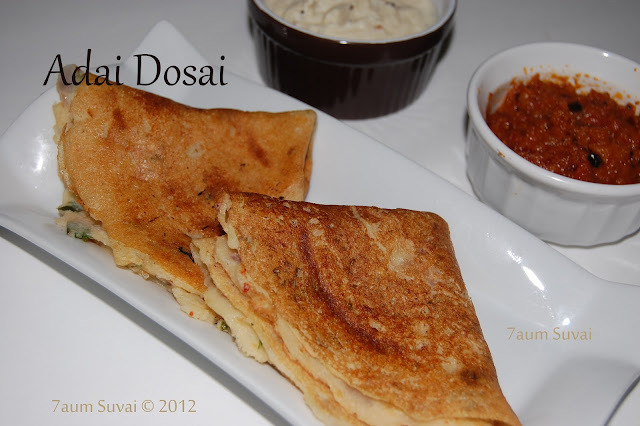 Adai Dosai is made from mixture of different variety of lentils. I tried different ways of making adai dosai but I was very impressed with the taste one which my mother-in-law suggested. I can assure that this will come out really good. Heat oil in the pan add jeera, asafetida, onion, coriander leaves and curry leaves sauté for few minutes or until raw smell goes. Add this mixture with the ground batter along with required salt. Now adai dosa batter is ready. Heat a dosa tawa and spread the batter like we make for dosa. Drizzle oil and cook on both the sides till golden brown. Serve hot with coconut or spicy tomato chutney or idli podi . Your Adai Dosa looks very tempting and presentation is also very nice. I usually make rice and dal adai by adding urad dal, channa dal and rice. Your method seems to be different from mine. i am going to try out your recipe soon and let you know how it comes out. Please go through it when you find time.